The concept of dissipative structures covers in principle all natural phenomena that exhibit internal organization under the influence of various evolution processes of which they are the host. A distinction is thus made from the beginning with the classical concept of equilibrium structures, such as crystals, which maintain themselves in the absence of all internal process. The fundamental characteristic of dissipative structures is that they occur far from equilibrium, as they can appear only beyond a critical threshold, in the domain of non linear processes. They are then maintained by external constraints. On the contrary, near equilibrium, all processes evolve in the direction order-disorder, according to the BOLTZNANN law. 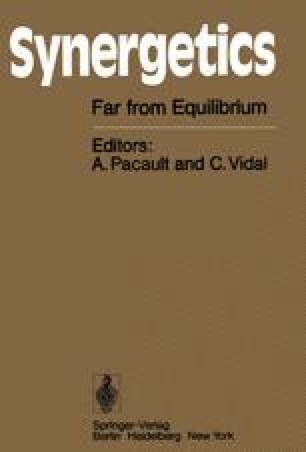 Hence the title of the present symposium: “Far from equilibrium”. Nevertheless, one should avoid to strict an interpretation of this outline. Biological order, for instance, which provides remarkable examples of dissipative structures, often involves a great number of processes, all of which save one are very close to equilibrium. If this one remaining process reaches the supercritical nonlinear region it can entrain evolution process of the opposite kind, namely disorder-order, which have long been unknown, albeit non disputed, by the second law of thermodynamics. In fact, it has been the recent progress in the field of thermodynamics of irreversible processes which has led to the new general concept of dissipative structure. The present talk briefly retraces the successive steps which were taken to achieve this goal : limit of validity of GIBBS’law for non-equilibrium states ; the concept of local equilibrium, the extension of thermodynamic and kinetic stability criteria to the domain of steady states and more generally to non equilibrium behaviours ; the connection with LIAPOUNOV’S theorems ; the destabilizing effects arising from the non linear domain ; the bifurcation analysis and study of spatial, temporal and/or spatiotemporal dissipative structures on simplified models (Brusselator and its further improvements at the Centre Paul Pascal). The extension to the domain of irreversibility of the concept of mechanical and physicochemical stability has completely reehanced the role of fluctuations on the subsequent behaviour of the system. Indeed, in the neighbourhood of an unstable critical state, some fluctuations may increase rather than regress, and become macroscopically enough large, to the point of allowing and influencing the appearance of further structures. As a result, an element of random is thus introduced into the strictly causal laws of macroscopic physics. Research in this field offers new prospects in the study of bifurcation theory for ordinary and partial differential equations, as well as in the study of stochastic processes for classifying the different types of fluctuations. As to the prospects for the applications of dissipative structures, already they appear extremely wide as they are involved far beyond thermodynamics itself, in nearly all domains where collective phenomena prevail. As yet some simplified [and mathematically tractable] models have been investigated in areas as varied as ecology, economics and sociology. At present however, the largest domain of application is provided by physics, chemistry and biophysics with the study of e.g. : reaction-diffusion processes, symmetry breaking beyond far from equilibrium, multiple steady states, biological membranes and their excitability active autocatalytic regulation processes, glycolytic oscillations, A.T.P. cycles, bacteria population dynamics, and the development of multicellular organisms. This field of research also open the way to new investigations about the mechanisms governing the formation of cancerous cells. Finally the appearance of a dissipative structure following a sequence of successive instabilities induced by fluctuations, is of major interest in the study of prebiological evolution and biopolymer synthesis.